Before we get married, when we first start dating, it seems like nothing can keep us apart. We focus intensely on each other. We think about each other all the time. We go way out of our way to see each other. We do crazy things to surprise each other. We choose each other first over all other friends and family. Making the most of your marriage with date nights can take you back to that courting time when your partner actually took priority. When we get married, all life breaks loose. The jobs get more serious, we have kids, chores and bills take up much of our time. We deal with the tyranny of the urgent, and calling about the carpool takes precedent over calling to catch up with our husbands or wives. Our routines can take the romance right out of us. And before we know it, all of these things fill up our time and there is not much left for each other. We take one other for granted and fall into the “someday, we will….” mindset. Today, we’re going to talk about something that is tremendously important to marriage and incredibly underrated— and that is the novel, but not so new idea of – FUN! Even the research shows it! FUN is one of the top indicators of satisfaction in marriage! and 3.5 times less likely to divorce. Given this knowledge, can we all agree that having fun together is beneficial to our marriages? Yet, in a recent study, 45% of couples surveyed said that they rarely had a date with their spouse, and only 18% of them said that they managed a date once a month. Where are you in these numbers? So, even though we know that weekly date nights are good, most of us still don’t do it. Why do regular date nights make such a huge impact on marriages? They help us stay connected/stay current with our spouses. Dates give us a chance to have long conversations like we used to – uninterrupted! They give us an opportunity to keep up on the types of challenges our husbands and wives face, things they are learning, things that are important to them, what they are thinking and feeling about life. Without time carved out of our crazy schedules, our conversations are in danger of being relegated to bursts of chatter between milk spills and diaper changes and sadly, never getting beyond what the kids did to push our buttons. They give us an opportunity for romance! Taking a break from everyday life, planning a special occasion, and getting out of our workout wear, is akin to creating a time where we will intentionally see each other in a better light. When we are on a date, we change our state of mind. We will see each other more like when we first met! It’s a chance to flirt again. They are a show of commitment. It is hard to carve out the time, arrange for a sitter and rearrange other obligations. So, when we do, it speaks volumes about how we value one another and want to make a priority of our marriages. Couples who are fiercely committed to their marriages have long happy ones; even through the mundane, stressful or the most turbulent times. They are an opportunity to expand your repertoire. Spending time together, doing activities and going places together give us an extra reference point for conversation! Shared experiences bring people closer. Obviously, we have a lot of shared experiences as married couples, but dates help us communicate outside the box of kids, money and chores. We become more interesting to each other. Calendar up with your mobile devices! (Or put in ink on your calendar if you are old school). Too many things can take over if its not planned. Turn off your cell phone and leave your to-do list at home. Your dates are a time to enjoy each other and to have uninterrupted conversation. All the rest is far less important and it can wait. Go out together- alone! No kids, no other couples. Try something NEW. Research shows that trying new, novel things activates the brain’s reward system. When we try something new, it floods our brains with dopamine and norepinephrine, “the feel good” chemicals. These are the same ones that show up when we are in the early stages of romantic love 🙂 Go play tennis even if you don’t know how, go somewhere that you haven’t been before, learn something new together. Bring your “A” game This is a date with the most important person in your life! It deserves your full focus and best effort. Imagine how you felt and prepared when you were first dating years ago. Comb your hair, brush your teeth, get “ready”! Plan for it to be a good time, as much as it is in your ability, and make it fun. Romans 12:10 says to try to outdo each other in showing honor. Try to outdo each other in giving each other a good date! It has been proven that weekly date nights are worth the effort, and will improve even a good marriage. 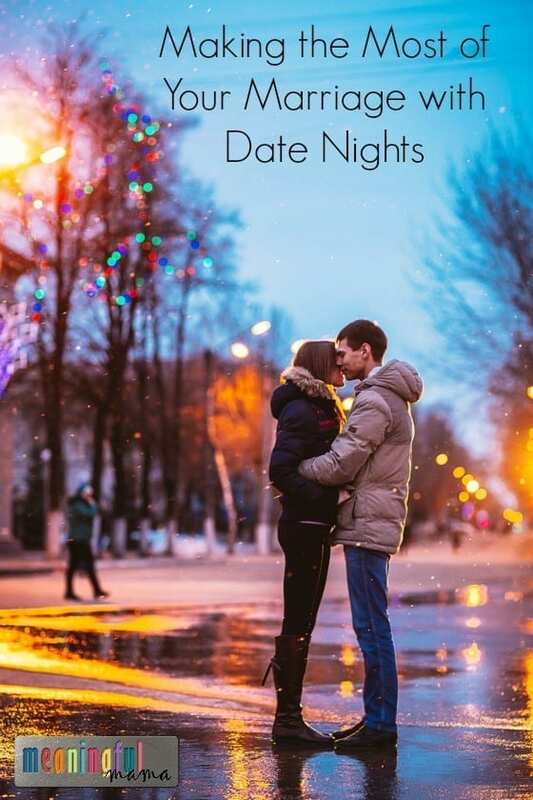 And, to overcome one of the most common excuses that couples give for not planning date nights, here are a few suggestions that will not break the bank. Take a picnic to the park. Go to the store together on the way to pick out some of your favorite treats. It can be as simple as bread and a fancy cheese – you know – Paris style. Take lawn chairs to high ground and watch the stars. Go to a Beach at low tide and look for sea creatures. Take kids to grandma’s or a friend’s and make nice dinner for each other at home. Have a coffee date. Find a new place with music. Take a board game to a restaurant or coffee shop. Go on a mini road trip to a local tourist spot. Take a class together – art, music, foreign language. Go swimming at a local pool. Go to Barnes and Nobel together and look at books. As you can see, the dates don’t have to be fancy or expensive, but they do have to be fun. Brainstorm ideas together that sound fun! 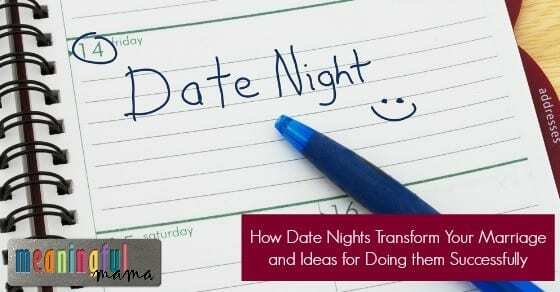 Get creative or get online for other date night ideas. Show your spouse how much you value your relationship and choose them first over everyone else! Get together tonight and schedule a regular weekly date night. Commit to spending time alone with each other. Rekindle your original fire and bring fun back into your marriage! Your marriage is worth the investment. If you want to read some of the research we talked about, go to nationalmarriageproject.org. I am involved in a marriage ministry at our church called ReEngage, and this date night post was written by my friend, Becky. Her and her husband did this talk at the ministry, and I asked if I could share it with my Meaningful Mama audience.